My 12th std was a sweetest period in my life, and I had an absolutely new look which matched my mentality, an absolute makeover to match my tomboyish attitude – ah, well… It was a typical bob cut. I infact preferred to go to the barber instead of a parlor. Why shell out a 150 bucks for a disastrous job and waste several hours for waiting and travelling, when I could just walk up to the end of the road and spend 20 bucks and get a perfect cut done.? My usual dressing perfected with this haircut, the jean and tee. Tiny little single orange stone nose rings served as my earrings which almost camouflaged in my Indian skin tone. Along with my makeover, came thousands of fabulous experiences. Just jotting down the best three for you to enjoy. One was when I cycled down an alley on my way home. It was the IOB Colony, Chennai. It was a beautiful street with trees on either side in full bloom in the peak of spring season and it was a bright sunny day, without much of heat. A perfect day to cycle around the town. And on this fine day, a kid was cycling his way yards ahead of me, to his home probably. I was in my usual jean and loose fit shirt, cycling behind him. We were opposed on the road by some 6 odd guys, in their early 20s, typically trying to kill time. They weren’t the roadside Romeos, just some simpletons. They almost blocked the road with 3 on one side and 3 on the other, with a little gap in between which would just let our cycles pass through. The one on the left towards the middle was having a nice ‘uruttakkattai’ (a log), and was swirling it towards the centre of the road, trying to scare the passing ‘boys’ (Note it – Only boys. They weren’t planning to be jailed on Eve-teasing case). This little lad who was going before me, bent down and escaped. As such those guys were just playing a prank with this, not really trying to harm the passers-by. Then it was my turn. The same guy was swirling the same “uruttakattai” trying to scare me. I was calm and in poise, pedaling on my way, when suddenly the one on the right screamed, “Dei……. PONNUDAAAAAA….!!!!!!! !” (Man…. It’s a GIRL!!!!!). The ‘uruttakattai’ was withdrawn immediately, with a terrified, petrified look on their faces. Only then did I realize, they mistook me for a GUY….!!!!!! The second experience came up when I sported a trouser, kurta combo to the temple..!!!!! I had to walk through an Agraharam to reach the Dhenupuriswarar Aalayam. I was walking down the lane, when a little girl clinging onto a tree, kept staring at me. She was so cute that I smiled at her. That must have given her some confidence. She gathered courage to speak to this absolute stranger and said “NEENGA PONNUDHANE…..?????!!!! !” (U r a girl, right…?????!!!!!). Oh my…….. I gave a mixed look and shook my head in positive. The third and the best was the train journey on my way to Hyderabad with my school pals in the typical school excursion. 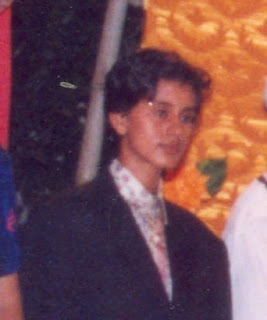 I sported a black trouser and a loose shirt as usual, and being in a girls’ school, obviously I was the odd (wo! )man out, surrounded by girls in salwar. It all started right from the Chennai Central station itself. My friend was dropped by her grandpa, when I was chatting with some other girls. He got annoyed and enquired WHOSE BROTHER IS THAT.????!!!!!! Then I was ‘re-introduced’ to him with my new hair cut. Then once in the train, we were 67 of us. The whole compartment was filled with us, but 5 others, who were distributed all over the compartment. Being the most talkative and an absolute extrovert, now it was my duty to compile them all to one place. I asked this person in his 30s something, in a polite soft tone, if he could shift places as we were a gang together. This Mr, held his hand around my shoulder in an absolutely friendly, supportive manner, as if talking to a NICE TEENAGED GUY. I immediately understood he had, as all others, thought I am a guy, so instead of embarrassing this poor co-passenger, I continued talking. He accepted the deal and exchanged places. Then in course of the journey, he understood, we were from a girls’ school and I am a GIRL…..!!!!!!! Must have seen his reaction when I turned to look at him before I got down at Hyderabad, poor soul, absolutely embarrassed….. In the course of the journey too several incidents occurred. Our dearest teachers, kept walking up and down the compartment once in a while to ensure our safely. And every time they got a moment of shock to see their dear young ladies surrounding, a HANDSOME YOUNG MAN, of course that’s me…..!!!!!!! A friend of mine, rested her head on my lap in the side lower berth and we all were chatting nonstop, when a dear co-passenger who walked down, stopped momentarily to look at the worsening scenario of Indian culture.! A gal happily resting on a GUY’s lap in broad day light in public place in a train. Oh my…..!!!!!!!!! She sweared, never to come near me until my hair is longer, I was more feminine. Now my hair is pretty long, but I still miss my dear bob cut. Wish I could get back to it. If I even thought of it, my mom says – “Planning to get married, wearing a jean to suit your haircut.????!!!!!”. Well, no answer for this…. Humourous stuff. You seem to be a bindaas person !Keep it up ! Ha ha... Ramakrishnan Sir... Thank you thank you.... Thanks a lot for visiting my blog and for your valuable comments. :)And do keep coming and do keep commenting. Would love to hear from you. I was the representative of Nobel Prize Committee to give peace prize to Mother Teresa. Appo edutha pic idhu. Ennadi nakkala... Remember than Janani, and Divya dance about Mother Theresa life in 12th std. That time. Hee hee... Thank you and Welcome to my blog... But which Viji is this...??? damn those words are soo true....i refer to your moms cooments....my mom screeches the same whenver i visit my barber to get my preffered short (police-man) cut..she screams- you look almost bald- what will you do if we have to go see a girl? the girl will reject you almost immediately....and i answer "if a girl cannot appreciate my 6 foot frame but is only interested in the missing few inches of my hair- good luck to her, she will end up marrying an effiminate guy with long hair who will turn out to be a homo on thir first night"......sorry, just letting off a little steam here- your post touched me to the core. Hm, this makes it sound like the makeover is done! I believe it's continuing :-) You haven't found the perfect disguise yet. Thank you. Glad you liked my blog.